Take a look at this selection of delicious summer drinks – they’re perfect to relax with, whatever the weather! There are some drinks that just scream summer. Think Pimms and lemonade, or a big fruity cocktail complete with mini parasol. I’ve been taking a look at some of the options around, so you’ll have the perfect serve if the sun ever returns to the UK. And I’ve been sure to pick out some non-alcoholic options as well. A great big pitcher of Pimms and lemonade is an iconic part of the British summer. It’s practically compulsory to drink it at Wimbledon, and it’s perfect for sharing with friends. But if you’re after an alternative spin on the idea then take a look at Sipsmith’s Original London Cup. It’s inspired by the punch cups that were so popular in 1800s London, when gin was all the rage. The London Cup is a blend of Earl Grey tea, lemon verbena and borage, with a selection of vermouth, aromatic bitters, and of course the classic Sipsmith London Dry Gin. Grab a large pitcher, pour in Sipsmith Original London Cup and top up with lemonade. Add ice and slices of lemon and you’re ready to head out to the garden! Or perhaps you prefer sipping a glass of wine in the garden on a summer evening. If so, then I can highly recommend The Dark Horse range of wines. They’re a brand from Modesto, California, and although you might not have heard of them before, they’re definitely a brand worth checking out. The Dark Horse team is lead by Beth Liston, who grew up around winemaking, and now wants to make reasonably-priced wines that taste ridiculously good. Quite a challenge! I’ve been taste-testing their Sauvignon Blanc and Merlot wines, and I think the Dark Horse Team have definitely met that challenge. I’m not usually a big fan of Sauv Blanc, it can be a bit too acidic for my taste. This wine has a hint of tartness about it, but the warm California sun means that it’s tempered by a fuller, more fruity flavour. If you’re after a change from the vanilla oakiness of Chardonnay, this is one to try. But I really, really love their Merlot. I’m careful when choosing reds because cheaper reds give me a banging headache, especially big full-bodied reds like a Merlot. But this one is gorgeous and very drinkable. It’s smooth, with big jammy berry flavours and without the heavy tannin that many Merlots have. And absolutely no hint of a headache the next morning! I’m definitely thinking of buying a case of this for Christmas celebrations as well. You can read more about the range on the Dark Horse website. The wines are available from retailers across the UK, and you can even pick them up on Amazon! A gin and tonic is always a great option for the summer months. But why not mix up the tonic by using something like Fentimans Pink Grapefruit tonic water. And if you’re thinking of packing up a picnic then Fentimans pre-mixed Blooms and Tonic are so convenient for popping in the picnic basket. They also do a pre-mixed Blooms and Rose Lemonade, which not only tastes delicious but looks very summery too. Or you could try mixing up your own mocktail using Fentimans Rose Lemonade. Just quarter-fill a champagne flute with chilled pomegranate juice and top up with Fentimans Rose Lemonade, straight from the fridge. A few pomegranate seeds or a raspberry to garnish, and you’re all ready to celebrate. A pitcher of this is a really good non-alcoholic option for a barbecue or party. Just use 250ml of Pomegranate juice for each 750ml of Rose Lemonade with plenty of ice to keep it chilled. 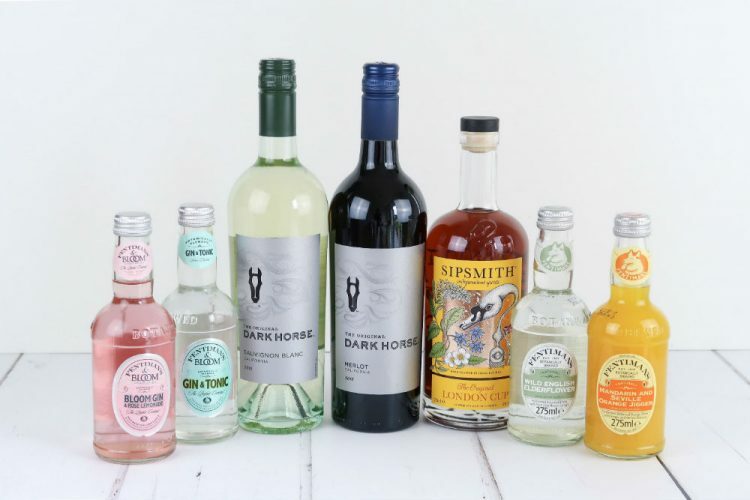 Fentimans do a fantastic range of soft drinks that are a little out of the ordinary. They’re great to have on hand for non-drinking guests at a party, or just for a long cool drink in the garden. I love the Mandarin and Seville Orange Jigger – it’s really sharp and refreshing. Now, I don’t want to make you feel jealous, but later this week I will be heading off for some sun in Portugal. I’m looking forward to sitting at the beach bar, looking out at the sea with a mojito or caipirinha in my hand. But if the good weather ever reaches the UK, then any of these drinks would be ideal for toasting the summer sunshine. So tell me – what is your favourite summer drink? ice cold lemonade for me! Well I do like a strawberry milkshake but I can’t drink those all day so I tend to drink Pepsi max. Dandylion and Burdock or a ginger beer sharp enough to disolve your tonsils! I craved D&B all through my second pregnancy – my son can’t stand it now! Oh me too, it’s delicious! Going to give the Dark Horse a try – thanks for the tip off. They’re definitely worth looking out for – the Merlot is particularly good! Lemonade with ice and mint or iced coffee! I’ll have a Victorian Lemonade if your offering….certainly great for quenching my thirst on hot summer days (if I can remember back that far). I love a good Shandy. Can’t beat the refreshment. Lovely, cold glass of cream soda! a nice cold shandy for me! Freshly squeezed home made lemonade is my favourite. I do love Fentemans drinks though, the ginger beer is lovely. My favourite drink is Fentimans mandarin and seville orange jigger, so refreshing! I like any flavoured slush puppies! Elderflower cordial! Very refreshing for the summer! The Cherry Cola is available from one of our local cafes in Chorlton and it is easily the nicest cola drink I remember tasting. It is light and refreshing with a smooth composition and none of that chemical-like after taste you expect of fizzy drinks. I am very keen on it. I love Fentimans Mandarin Jigger but if I am going on picnic it has to be Ginger Beer! I love a Pimms, it normally means I am lying on the grass somewhere with nothing better to do than watch the clouds go by. I absolutely love cloudy lemonade during the summer months, it is such a refreshing drink. A refreshing peach iced tea for me! Always reminds me of summer. I really love pink lemonades but fentimans rose lemonade stands out as one of the best! i do like a dandelion and burdoch! Cherry Cola is my favourite! Fresh orange juice and lemonade. Love ginger beer, a real taste of summer ..
Home made lemonade is a real thirst quencher and delicious. I love a gin and tonic. The best thirst quencher in hot weather is cola. Any of the usual brands are good, but there is something a bit extra special about Fentimans cola. i love cola in hot weather!!! I like rum and peppermint. Cloudy Lemondade during the day, Vodka and tonic in the evening! Ice cold Pink Grapefruit juice. I just love it. Cloudy apple juice with ice. Elderflower cordial – to me elderflower is the taste of summer. I’m a big lover of rose lemonade! Gin and Tonic in a long glass with ice and a squeeze of lime juice. My favourite summer drink is home fresh lemonade. Elderflower cordial is for me the quintessential taste of an English summer. Light, fragrant and refreshing. Just perfect like our English weather that’s never too hot or too cold. My favourite summer drink has to be Pimms. When it’s really hot I love a shandy. A lovely dandelion & burdock any day. Reminds me of childhood. My favourite summer drink is Cava – but I can’t drink that all day every day! Otherwise, I love Fentiman’s Rose Lemonade. It’s like liquid Turkish Delight. I’ll often dilute it a little with sparkling water so there’s just a hint of it – lovely! Pimms No 1 cup – only ever drink it in the summer and it’s great. Not particularly original, a summer Pimms. Pink lemonade with gin of course!!!! My favourite summer drink is Fentimans Dandelion & Burdock. It’s so much better than any other D&B, and I’m wondering why it’s not in your photos? Pina colada! With a cherry on top and an umbrella… Del Boy style! Nothing fancy, just sparkling water with ice and a slice for me! Sparkling lemon and lime flavoured water. I love a home-made lemonade, so refreshing. I really like rose lemonade as a summer drink. Anything fizzy and fruity is my summer go-to! I really love malibu and pineapple! there is something so summery about pineapple and coconut tropical flavours! I love the Fentiman’s Rose Lemonade…either just with ice, or with the addition of gin! It’s so refreshing! I love a cold White wine Spritzer. Wild english elderflower fresh out fridge with ice cubes and frozen strawberries. I love orangeade with ice. Anything with elderflower, still or sparkling it’s my favourite flavour! I absolutely love rose lemonade with ice, I’m drinking some right now. A glass of fresh orange juice. Gin and Elderflower for sure! Has to be pink lemonade for me! Gin and tonic with lots of ice and slices of cucumber and some mint leaves! Delush!!! Well I do love dandelion and burdock, but my ultimate summer drink has to be pina colada, but only only on holiday! home made lemonade with fresh mint! I like a nice cold cider with a dash of blackcurrant. I love all of these drinks all year round, but for summer I say Ginger beer, the main reason being I’m the only on e in this house who likes it and it doesn’t dissapear! I love gin and fentimans pink grapefruit tonic water. I received it in my craft gin subscription box and loved it!! Summer soft drink? It has to be pink lemonade as it takes me back to childhood, so refreshing! Alcoholic it has to be a refreshing fruity cider! I love pink lemonade and I also love bitter lemon. That orange drink looks yummy! I love Lime & Soda!! Either chilled cider or wine. But not at the same time! My fave drink for summer has to be vodka lemonade and lime! We had a barbecue at the weekend and I have been converted to an Aperol Spritz – Aperol, Prosecco and Soda Water. We put slices of grapefruit in too. Such a refreshing drink. The weather was beautiful and I was mentally transported to Amalfi!! I always go for elderflower – lovely with added ice. Ice cold ginger beer with a twist of lime. Limoncello topped-up with lemonade, and lots of ice. Pink lemonade with ice and a slice! Chilled water but not too cold. Ice cold water with a dash of lime juice. I love an ice cold beer! Shloer – nothing gets a picnic more buzzing! For me it has to be soda and lime this year! I’ve loved it! I like an ice cold cider, preferably Westons Vintage. I like to drink cider in the summer. It has to be a cocktail of two in a beer garden. Ice cold pink lemonade or a dandelion and burdock!! My go-to drink this summer has been a nice cold glass of orange, cranberry, lemonade and ice! Prosecco, with elderflower cordial, mint and lemon. Delicious! Usually diet coke with a splash of lemon juice and plenty of ice. Lemonade is my favourite drink for the summer. Diet coke or Fanta, love them both. I love a lime and soda! Well i like to experiment with home made drinks and this ones my fave. Combine tangy red tea with slices of lime, and add ice or combine lemon-lime soda with summer berries. Definitely Victorian lemonade – a timeless classic. I love cloudy lemonade, so refreshing! My favourite since childhood, an ice cold dandelion and burdock! Pepsi Max…. but I also love rose lemonade. I love classic cloudy lemonade over ice! For me it’s gotta be ice cold lemonade. Vodka and rose lemon Fentimans…..thankyou! I love a nice cold cider with plenty of ice. Pimms. Coupled with a nice bowl of strawberries. Pimms with lemonade for me. Naked Grouse with Fentiman’s Cherry Cola, Ice Cubes and a couple of cherries – refreshing! I love anything with elderflower, it’s extra nice with a little gin too! my favourite drink is anything elderflower based – love it in summer!